I would venture to say that, other than producing Christopher Columbus, Liguria is probably best known as the home of pesto genovese, or basil pesto. But the region produces another kind of pesto, known as salsa di noci or Walnut Sauce, that deserves much more attention. The most typical use of salsa di noci is to dress pansoti, or ‘pot bellies’, a kind of triangular Ligurian ravioli stuffed with cheese and an mixture of greens and herbs known as preboggion. But I find that walnut sauce works very well with all sorts of fresh or dried pasta or, best of all, gnocchi. Traditionally made in a mortar and pestle, these days the food processor make short work of preparing salsa di noci. If you use store-bought pasta or gnocchi, you should be able to get dinner on the table in 15-30 minutes at the most. Looks-wise, Walnut Sauce is not particularly spectacular—it’s rather pale and wan, in fact—but the taste is really something special. Nutty, of course… but the pinoli add a certain sweetness, the Parmesan savory umami, the bread and milk a gentle creaminess and the garlic a subtle hint of pungency. Try it and you’ll see. Milk, about 125ml (3/4 cup) or q.b. Put the walnuts, pine nuts, garlic, bread, grated cheese, olive oil, salt and, if using, Greek yogurt in a food processor until you have a rough paste. Little by little, add the milk through the funnel of the processor until the mixture turns smooth and rather thick but rather soft. Taste and adjust for seasoning. Add the marjoram and give the sauce one more whirl. Take your gnocchi (using this recipe for homemade potato gnocchi or just use store-bought) and boil them in well salted water until they come to the surface of the water. Drain the gnocchi (but not too well) and transfer to a large warmed bowl. Add the walnut sauce and, if you like—although some sources call it heresy—a knob of butter. Mix gently with a spatula, adding a bit of the water in which you boiled the gnocchi to thin out the sauce if need be. Serve immediately with additional grated cheese for those who want it. There are any number of variations for salsa di noci, or Walnut Sauce. Many recipes call for blanching the walnuts and removing their semi-bitter skins. I rather like the slightly bitter taste, so I don’t. But if you are put off by the slight bitterness the skins impact, by all means, you can add this extra step. Most recipes call for grated Parmesan cheese rather than the original prescinsôea. Not all call for pine nuts or the marjoram. Some call for cream rather than milk which, of course, gives you an even richer sauce. Some say the garlic is optional—just about all will be discrete in its use. In some versions of salsa di noci, the sauce is still rather rough, in others smooth—Le Ricette Regionali Italiane (Solaris) tells you to pass the sauce through a sieve. The sauce is sometimes quite thick, to the point that it’s rather sticky. Other times, as shown here, the salsa di noci is thin enough to “flow”, which is the way I prefer it. I add enough milk so that the Walnut sauce itself is fairly soft, then thin it out further with a bit of cooking water when mixing with the gnocchi. Be careful not to overdo it, or the sauce won’t coat the gnocchi properly. Going further afield, you’ll find recipes that pair this sauce with Speck, the Tyrolean salumi, diced and mixed in with the gnocchi. I published the original version of this post in July 2009, only a month after I started blogging. I’ve completely updated and re-edited it for reposting in January 2018. Drain the gnocchi (but not too well) and transfer to a large warmed bowl. Add the walnut sauce and, if you like a knob of butter. Mix gently with a spatula, adding a bit of the water in which you boiled the gnocchi to thin out the sauce if need be. Just got back from a week in Rapallo. 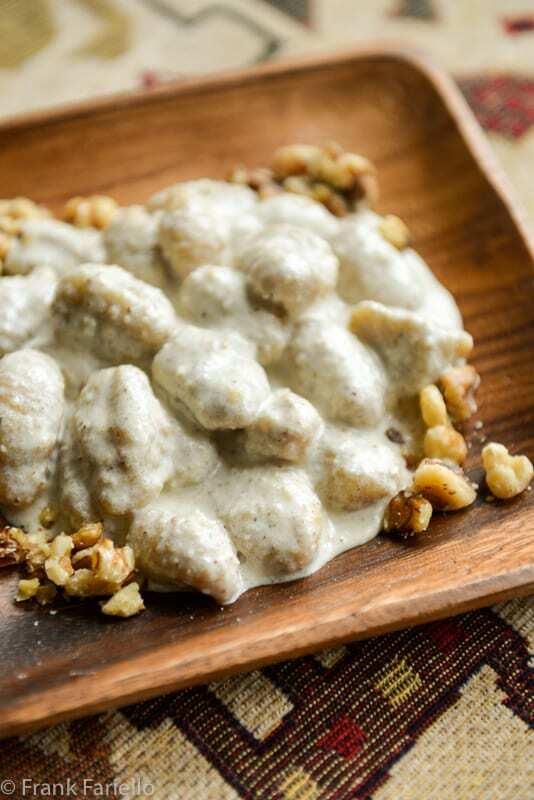 We tried pansoti with walnut sauce in three different restaurants. Delicious. Looking forward to trying your recipe. There is noting more satisfying the flavor of fresh nuts and as a base for this exquisite sauce, a veritable feast. I am forwarding this to my college daughter, she will absolutely love it….grazie Frank. We love salsa di noci but know it from Tuscany. I didn’t realize the root of the pasta! I’ve had a walnut sauce on pasta in Genoa, and used it myself with ravioli, but never on gnocchi. Here’s yet another one I shall try before the winter is over. Ha! Somehow I think you’ll survive the onslaught. 😉 Walnuts are marvelous, aren’t they? Thanks, Cristina. Definitely worth a try! I have been thinking about making pesto out of walnuts. Italian pine nuts are prohibitively expensive and very difficult to source; most pine nuts in Toronto come from China and I refuse to buy it (google pine nuts from China to see how awful they are, who knows what they grow them in, but some people have their taste entirely altered for a month or more even). I’ve been using almonds and now with your recipe for walnuts, I’ll be all set! Homemade gnocchi is awesome. Hungarians use walnuts quite a bit, so I always have a bag in the freezer. Walnuts are great, even in basil pesto instead of pine nuts. Not sure I’ve ever had the Hungarian variety, but now that I’ve done a quick Google search, I want to try one. I am going to try this delicious looking walnut pesto. I have a recipe for sweet potato gnocchi , do you think I can use your sauce on them? mi hai dato una buona idea per condire gli gnocchi, ho sempre usato la salsa di noci per i pansoti e i ravioli in genere, grazie Frank, buon weekend ! Buon weekend anche a te, Chiara! Love this stuff! I’ve haditin restaurants several times, but never made it myself. Now that I have this recipe I can! 🙂 Thanks. You’re welcome, John! Enjoy! It’s really easy to make, as you can see. What memories this brings back! I first had walnut sauce on gnocchi for lunch in Siena. Not Liguria, but it was still incredible. I tried to duplicate it at home, in. Fact I think it’s on my blog, but now that I have a recipe I can make it properly! Well, from your blog post it does indeed sound like you really liked this dish: “I ordered gnocchi with a walnut cream sauce. And, it could definitely be my last meal on earth, if I had a choice in the matter.” Fine praise indeed! Lovely. If one is then so lucky to find new season walnuts, still soft and very buttery, it is even better. it is one of the most underrated areas in Italy, I think, from a gastronomic point of view: and yet, it is full of delectable dishes, especially vegetarian. The Colman Andrews’s book would be a good starting point if some one is curious about this tiny region (as well as the Laura Schenone’s one). Thanks for the tips, Stefano. Wasn’t familiar with either of those books. Sounds delicious will make tom orrow for dinner. I've never had a walnut sauce, but am very intrigued by the idea. It must have been an amazing thing to have your grandmother's food.